The people who commissioned this work wanted a piece of Mission Beach to take with them on their caravan tour of Australia. Certainly one of the more interesting commissions! 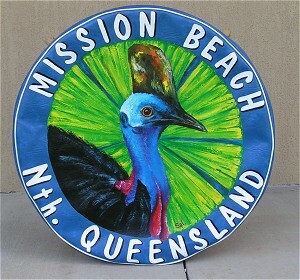 I never tire (no pun intended) of painting representations of our magnificent local cassowary. My friends tell me this is my best painting of a cassowary to date.